IOWA CITY, Iowa—Growing up in nearby Wisconsin, Kaitie Keough (Cannondale p/b CyclocrossWorld) first raced at Jingle Cross when she was 15. Since her Jingle debut, she has gone on to accomplish great things at the race, including a third in the World Cup in 2016 and a second in last year’s race. The one thing missing from her palmares heading into Saturday’s World Cup was, of course, a World Cup win. Could she take the final step and stand atop Mt. Krumpit? Despite Keough’s success at the race, even winning last year's UCI C2 Friday Night Fight, winning on Saturday would not come easy. 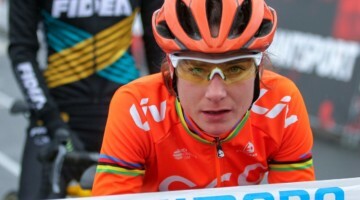 Keough has been off her game thus far this season due to illness, and Marianne Vos (WaowDeals Pro Cycling) showed last weekend that she is on mid-season form during her early cyclocross start. Early on in Saturday’s race, Vos picked up where she left off last weekend. After Eva Lechner’s (Clif Pro Team) early lead was snuffed out by a Mt. 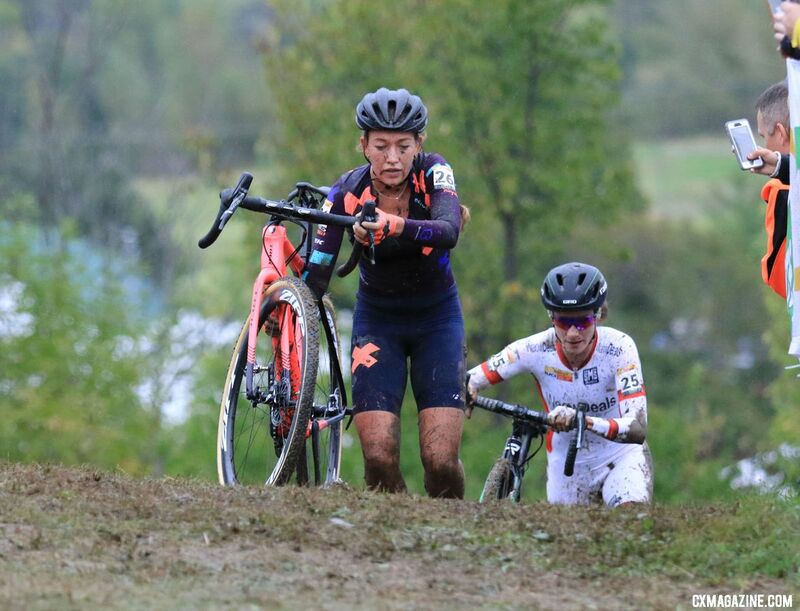 Krumpit descent made infinitely slicker by pre-race rains, Vos took control and after one lap appeared poised to ride away with her second-straight World Cup win. In the second lap, Keough made the chase along with Sophie De Boer (Breepark Rapha SRAM Trek), and when she reached the Mt. Krumpit descent, she was closing Vos’ gap. Shortly after leaving Mt. Krumpit, Vos crashed on one of the corners made slick by the pre-race rain. Keough grabbed the lead and by the end of the lap, her lead was 10 seconds on the seven-time world champion. 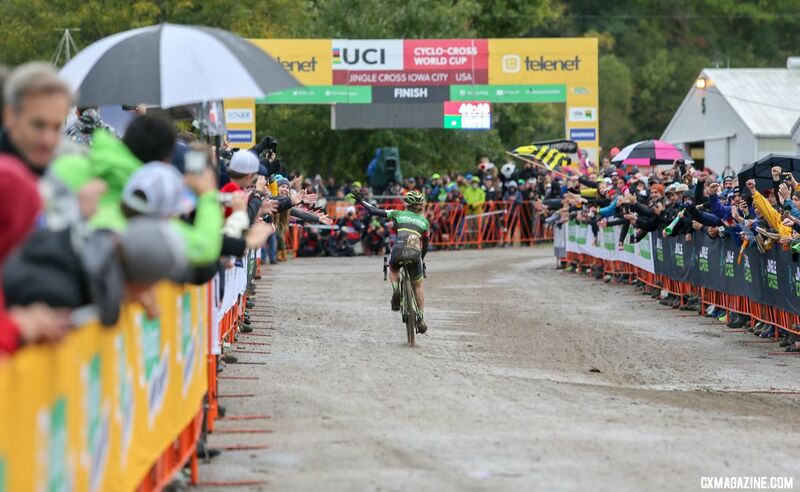 The next two laps belonged to Keough, although with the Grinch’s treachery (aka mud) lurking at every corner, the second half of the race was anything but a coronation. 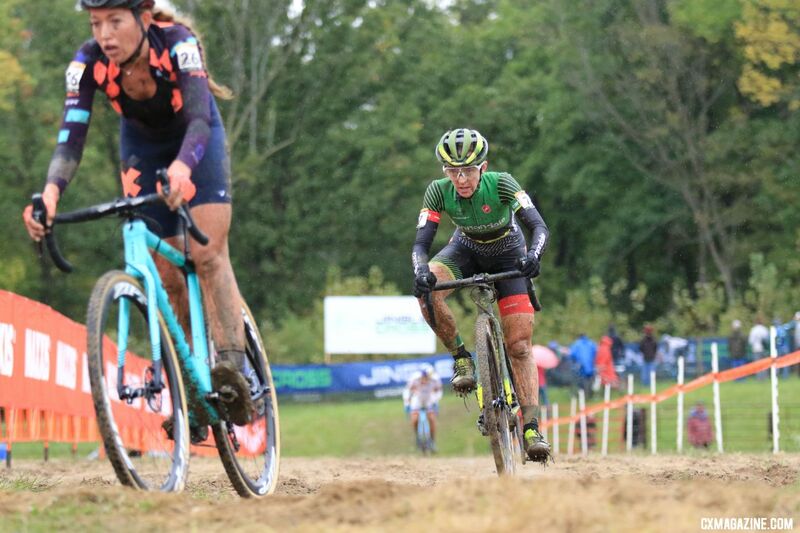 Keough crossed the line to cheers from the Midwest crowd, completing the biggest win of her impressive Jingle Cross career and taking her first career World Cup Win. 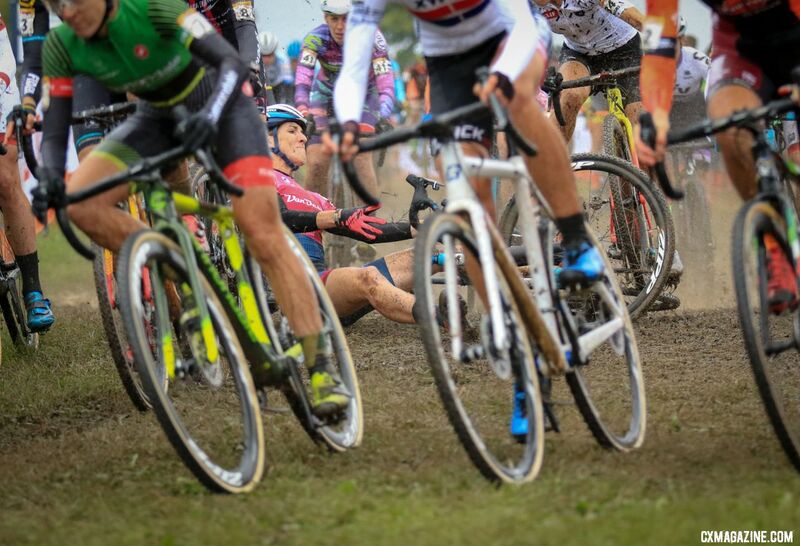 The ability to adapt is an incredibly important skill for cyclocrossers to have. On Saturday, the Elite women got the chance to show how they can adapt from pre-ride to the race. After rain on Friday, the mud at the Johnson County Fairgrounds started to tack up as the lines got ridden in. During pre-ride, the Elite women were able to dial in their lines on the switchbacks that were a mix of tacky and slick. Shortly before call-ups for the marquee Women’s race started, the heavens opened up and a short 20-minute rain fell. By the time it was done, Mt. 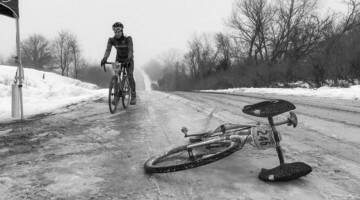 Krumpit turned into a slick, treacherous descent reminiscent of the race’s November and December roots. At the start of the race, Lechner quickly asserted herself, taking the holeshot and leading the first run up the Mt. Krumpit climb. After Katerina Nash (Clif Pro Team) crashed before the Frostbite Forest climb, Vos accelerated up the long climb to join Lechner at the front. The first trip down Mt. Krumpit descent was the first time the women saw the steep hill in its wet condition, from standpoint of water. Lechner tried to ride and got slowed up, while Vos and many of the other women immediately started running. Vos’ choice proved a good one, as she came out of the feature with a several-second lead. 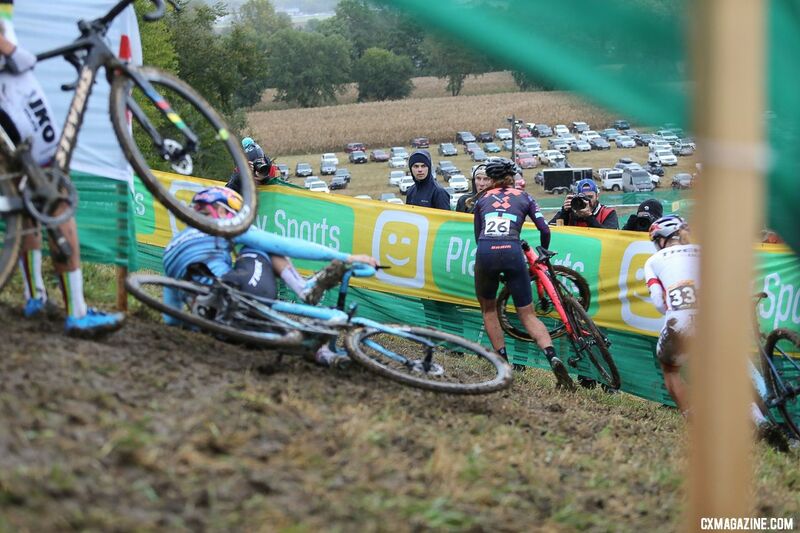 At the end of the first lap, the chase behind her was Lechner, De Boer, Keough and Evie Richards (Trek Factory Racing CX). Behind them were Sanne Cant (IKO-Beobank) and Katie Compton (KFC Racing p/b Trek Knight). The four chasers caught Vos on the very long start/finish straight, but Vos again opened a gap by riding the Holly Jolly Hellhole high-low off-camber while most of the other women ran. When she hit Mt. Krumpit, her lead was again almost five seconds on a chase that shrunk to Keough and De Boer. On the backside Lap 2 climb, Keough passed DeBoer and headed up the chase of Vos. Vos had a good 10 seconds at the top of the descent, but by the time the two riders reached the bottom of the series of steep switchbacks, Vos’ gap was down to a few bike lengths. On the first turn after Mt. Krumpit, disaster struck for Vos. Keough took advantage. 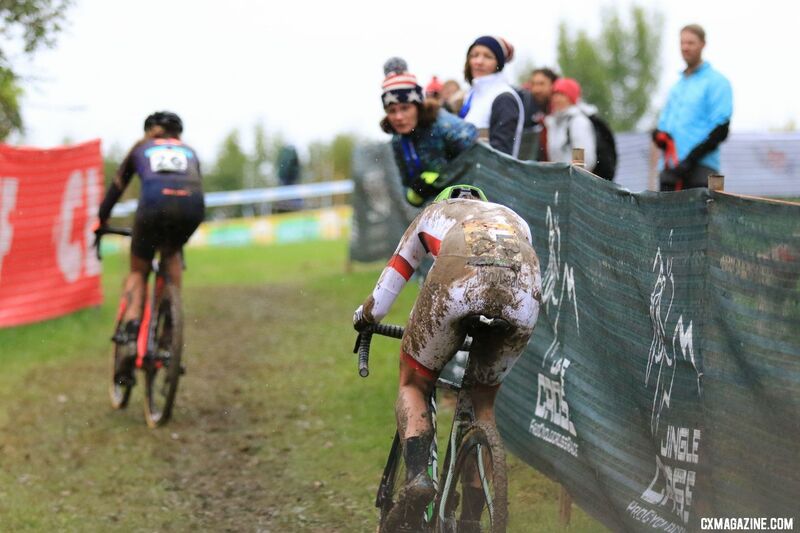 As Keough pedaled hard to solidify her lead, Vos struggled with small mechanical issues in the back half of the lap. When the second of the 4 10-minute laps was over, Keough’s lead on De Boer and Vos was 12 seconds. In the third lap, Keough doubled her lead, while the chase group became Vos, De Boer and Richards. At the bell, only Mt. Krumpit and the Grinch stood between Keough and her dream afternoon in Iowa City. 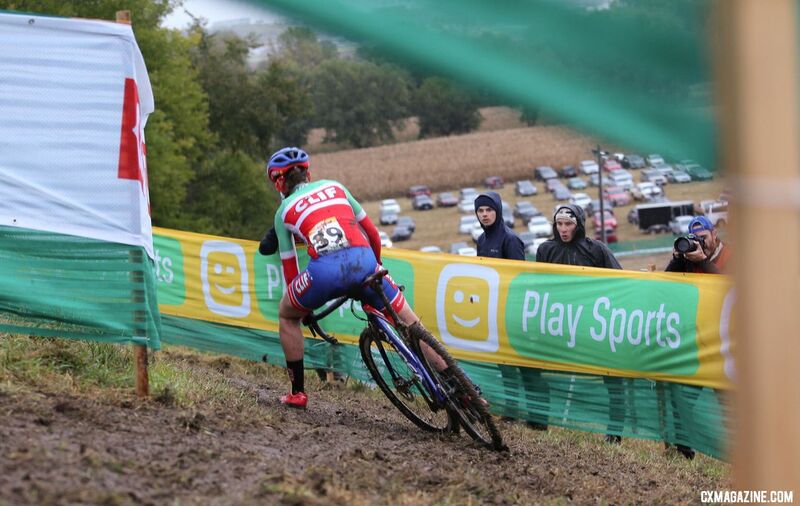 Keough’s last lap of the Jingle Cross course was flawless. However, with the slick conditions, there wouldn't be any celebrating until you could hear the sleigh bells. 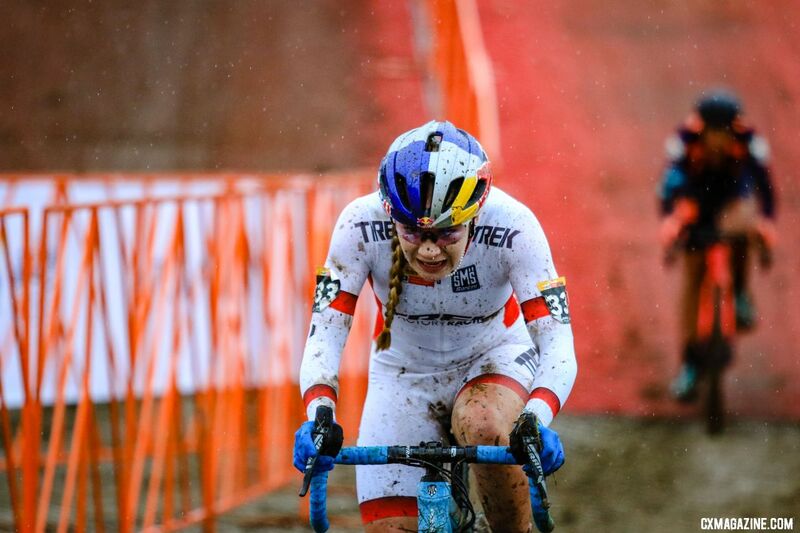 “When you descend that little steep descent at the end of the last lap and then do those snake turns, once I got to the bottom of that, I was like, wow, I can win,” Keough said. After she cleared the final descent of Mt. Krumpit, Keough finally had a few seconds to soak in the win, experience and a little extra mud for good measure. Behind Keough, a tight battle for second reached its climax in the fourth and final lap. Vos took over second on the long climb of Mt. Krumpit, but then she stalled out trying to ride the first part of the descent. Richards took over second, only to give it up after swapping bikes because she was unable to get into her highest gears. The run through the pits allowed De Boer to slide by. But Richards wouldn't be denied. The Brit reclaimed the second step of the podium after a furious chase, leaving De Boer and Vos to fight for third. Richards held the second spot, and with the finish, also retained the U23 leader’s jersey. Vos outsprinted DeBoer after the last corner to take the third podium spot. Ellen Noble (Trek Factory Racing CX) finished in 12th and Elle Anderson (Milwaukee Alpha Motorhomes) in 14th rounded out the top three U.S. finishers. Compton finished in 15th. 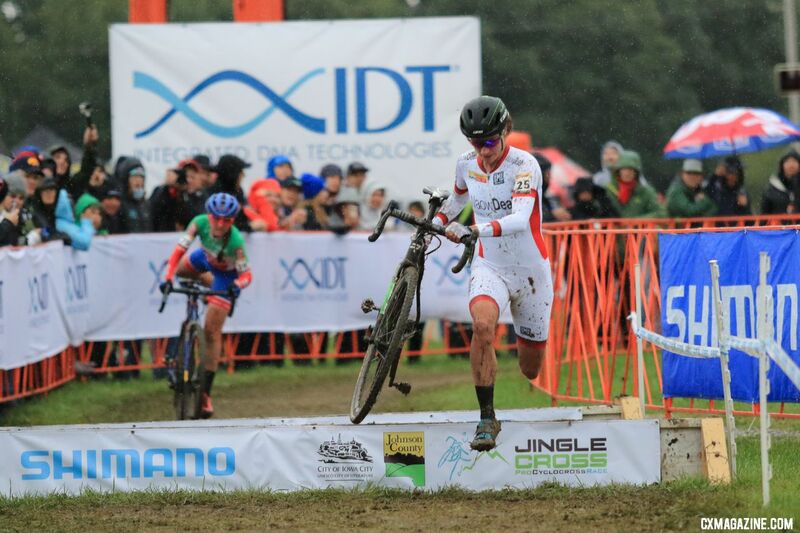 Maghalie Rochette (CX Fever p/b Specialized) bounced back from a first-lap crash in the holeshot to take ninth. Emma Swartz (Trek Factory Racing CX) took second for the U23 women and Fleur Nagengast (Telenet Fidea Lions) took third for the U23s. See our photo gallery and full results below. Stay tuned throughout the weekend for full coverage from the 2018 Jingle Cross UCI Cyclocross weekend. Watch the Telenet UCI Cyclocross World Cup replay here.